This August I travelled to the International Quilt Festival in Suzdal, Russia. It was a 10 day trip, with 8 of them spent at the Quilt Festival and in the immediate neighbourhood of Suzdal, a small town about 2 hours east of Moscow. I have been wanting to visit a Russian quilt event for a while, as I know there are several, and when I saw pictures similar to this one posted on the internet last year, I decided that this was where I wanted to go. Suzdal is a very old town. It was founded nearly 1000 years ago, and for a while it was the capital of a principality while Moscow was still merely a small outpost. The Suzdal Kremlin (photo above) is way older than the more famous one in Moscow, and is on Unesco’s world heritage list, along with one of the monasteries in Suzdal. The capital was moved, but over the centuries, Suzdal became a religious centre with several monasteries and lots of churches. During the Soviet time, industrialization passed Suzdal by, and much of the old architechture was preserved. When the people realized what a gem they were sitting on, laws were passed to prevent highrise buildings in or near the town centre. More than 300 buildings in town are now listed or protected, including 5 monasteries and more than 30 churches. Suzdal is now a major tourist attraction on the so called Golden Ring, and more than a million tourists visit every year. This also means that the place is well equipped with reasonably good hotels and restaurants, so the town, with a little less than 10 000 inhabitants, is capable of hosting quite large events. The travel agency connected with the quilt festival, which organized the tour, had put together a varied and interesting program, which, in addition to the quilt festival events, also included a trip to a local farm and several guided tours of the town and area. 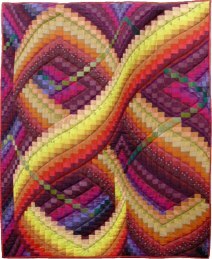 Since there were so many interesting things to do, and to look at, that were not necessarily quilt related, I brought along two family members who are not quilters, and we all enjoyed ourselves very much. The quilty events like exhibitions and classes were spread out on 8-10 locations throughout the town; – in hotels, churches, culture house, library, and even inside one of the monasteries. Exhibitions were open every day for more than a week. The quilt shops were located in one of the hotels on the outskirts of town, along with the show administration and most of the classes. Our hotel was in the very centre of town, right next to the town square where much of the entertainment was going on, and with short walks to most of the exhibitions and attractions, and to a variety of good restaurants. Some events were one day dos, like the Quilted Field event held in the grounds of the Museum of Wooden Architecture. 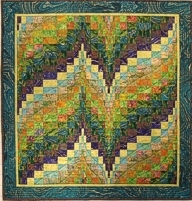 People sew quilts of the same size, 1 x 1 meters with ribbons attached to all four corners. The quilts are then laid out on the grass in a checkerboard pattern, and tied together at the corners. The audience can then walk, run, dance, or skip in between the quilts, all across the Quilted Field, enjoying all the different colours and motifs, and of course take lots of photos. People love to pose with their quilt, or with their family and friends, and photograph each other in the field. In addition to the quilted field, there were also quilts hung on clothes lines and on the walls of the old houses around the area. There were also lots of stalls selling food and various crafts. In addition to all this, the organizers also put on a more than 4 hour long show with lots of song and dance, traditional wedding processions and games, in which both young and old took part. 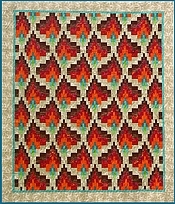 The theme of this years quilt festival was “Love”, and on this day the focus was on courtship and weddings. There was a special competition category of wedding quilts, and these quilts were hung around the area, and the winners were announced at the end of the day. People had dressed up in traditional wedding dress, and a procession of wedding guests following the couple marked the start of the show program. Later the guests mingled with the audience, and it was interesting to study the various costumes they were wearing. Quilters also wore their home made dresses, and we recognized a few of them from the fashion show in the town square on the previous day, – more on that in a later post. On stage a folk dance group sang and danced to traditional folk tunes. They were very good, and wore a variety of wonderful costumes, – the sort quilters would love to take a closer look at. I think they performed for more than an hour, and still I was sorry to see them go. The audience were invited to learn traditional wedding dances in front of the stage. One couple led the dance, one lady had a microphone and explained the moves over the loudspeakers. Of course, we did not understand the words, which were in Russian, but we understood the moves and steps that were shown. They started out with the polonaise, which we also did at our daughter’s wedding 10 years ago, so it was really very similar to our customs at home. DH to the right, – he is a good sport. Hurry up Grandma, – let’s go dancing! A small play was performed, again all words in Russian, but you could guess a lot from the mimics and tone of voice. My guess is that this was about a young girl who wanted to be a fine lady in town, and turned up her nose at the simpler farm girl who wished to stay put. However, the farm girl got the eligible young man in the end, but luckily an officer also came to the rescue of the “fine” girl, so all was well in the end. The whole thing was very informal. You could sit and watch all the time, or get up and walk around looking at the quilts, participate in the dancing and games, go have a snack at one of the stalls, or sit on the grass enjoying your packed lunch. There were not only quilters present, but families out for a Sunday afternoon walk, officially invited guests, and also busloads of tourists visiting the museum as part of their tours. Everybody seemed to enjoy themselves very much. This is already getting too long. 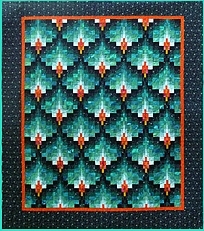 I will have to make several new posts to show you more of the quilts, and of other (hopefully) interesting stuff.